I can’t believe that summer time is fast approaching! I’m sure many people start thinking about when they will take their summer vacation. Have you planned your summer vacation yet? My husband and I are planning on going to Canada or Hawaii around June or July this year. It’s not confirmed yet but my trip to the Philippines is coming up. I’m really excited about my upcoming trip to my homeland. I can’t wait! 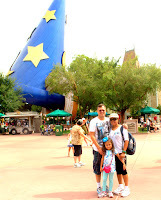 Last year, we had so much fun during our summer vacation to Orlando, Florida. I like Orlando. It’s one of the great places to go in the US during summer time. Orlando is home to Walt Disney World, Sea World and other famous mega-theme parks, including Discovery Cove and Universal Studios. You can also choose from several outstanding golf courses in the area, a family-friendly science center, plenty of entertainment options and a fine art museum. And if you are on the lookout for Orlando Hotels, OrlandoEscape has the selection you need and savings you want. You might also want to visit their Facebook page for deals and other special offers. Hi Dhemz, how are you? We want to visit this place too !!! Maybe this summer, who knows right? Its nice to know that your plans are up for the coming summer. That must be really exciiting for you to visit your homeland, Philippines. I haven't been to all the places you 've mentioned here, but hope so someday. Yes, you really had a good time in Orlando, Florida last year together with the Cottrill family. Hope you will be able to visit the Philippines again this year or early next year. Thanks for the post. God bless you all always.